We all know that the phrase “once in a blue moon” means “rarely”, but do you know what a Blue Moon really is? CLUE: It has nothing to do with it being the colour blue, although the Moon can develop a bluish tone caused by excessive dust particles in the atmosphere (such as when Mount St Helens erupted in 1980). 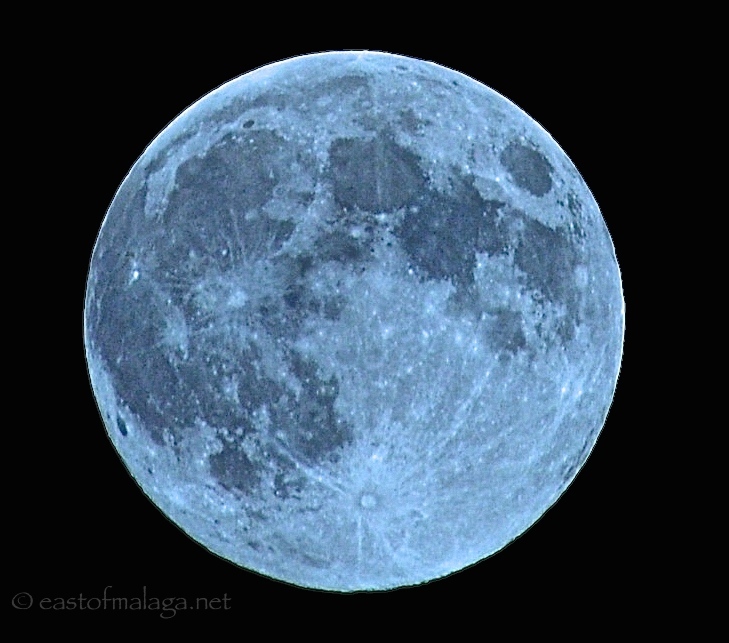 Well, the modern-day definition of Blue Moon refers to the second full Moon in a calendar month with two full moons. The last Blue Moon was on 31st August 2012 but you’ll only have to wait another couple of days until the next one, this Friday (31st July 2015). Make the most of it though, as the one after won’t come along until 31st January 2018! In the meantime, I’ll leave you with Frank Sinatra singing “Blue Moon”, of course! This entry was tagged Blue Moon, full Moon, once in a blue moon. Bookmark the permalink. It wasn’t blue! I actually expected it to be blue haha! I often look out for the ISS (from the UK ) but it does not pass every day. You can log onto spotthestation.nasa.gov and register to receive emails or texts whenever the station can be seen with times and location in the sky. It will appear at exactly the time they say, faintly at first, and move across the sky looking just like a bright moving star. I am always amazed that there are people aboard the ISS every time it passes and probably wondering why we are creating so many problems here on earth when from up there it looks so beautiful! I will look out for the blue moon tonight. Well, I’ve learnt something new today! I love fascinating facts like this – we have a wonderful moon tonight in Bexhill on Sea! Wow! You are so very good at what you do! We are listening to Frank sing “Blue Moon”, loving the great tune, and looking forward to meeting friends to picnic on Playa Torrecilla Friday night, July 31! Will eat and drink, and I now plan to play this great tune “Blue Moon” with many thanks to you for this lovely posting! Many thanks and best regards! I knew what it was but not that there’s one due 🙂 thanks!